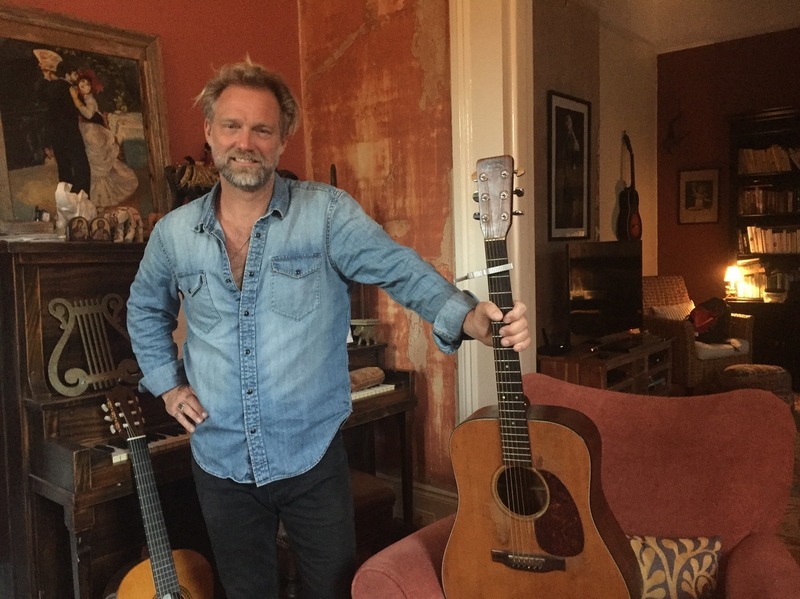 'Send Me A Friend': Anders Osborne Starts Program To Help Fellow Musicians Stay Sober : Shots - Health News New Orleans bluesman Anders Osborne is launching a program to help musicians and others in the industry stay sober in work environments that are often centered around drugs and alcohol. Anders Osborne at his home studio. The New Orleans bluesman is launching a program to help musicians and others in the industry stay sober in a work environment where that can be difficult. He got into recovery and was putting his life back together when he remembers counselors telling him to take a year or two off, try something different until he could get back on his feet. He was facing bankruptcy and foreclosure on his house at the time. "I mean, I'm in a bad situation. I'm going to take a minimum wage job at McDonald's?" Osborne says. "What am I supposed to do? So that frustration led to me thinking well, 'There should be a support system. ... specifically for this.' "
He means specifically for people in the music industry who are trying to stay clean. Osborne walks through Chickie Wah Wah, a popular New Orleans music venue, where you have to walk past the bar to get the stage. That's tough for an addict, Osborne says. These days, he comes with a game plan. They showed up and they just sat next to the stage. They didn't do anything. They didn't talk to me, didn't do anything. They just sat there. It was such tremendous help. Anders Osborne, Musician on how he got the idea for "Send A Friend"
"Here's how long I'm going to spend at the bar. I'm not going to show up an hour and a half before. I'm going to show up 10 minutes before the show and that's all," Osborne says. "And you have to really stick to that. I'll design the whole situation according to my comfort because I'm here to work. I'm not partying." The once notorious partyer, now 50, has been sober for about eight years. He's working with the nonprofit CAN'd Aid Foundation to help musicians navigate that fraught setting. The program is called Send Me a Friend, taken from the title of one of Osborne's songs. The idea came after some friends came to his first big New Year's Eve show after he got sober. "They showed up and they just sat next to the stage," he says. "They didn't do anything. They didn't talk to me, didn't do anything. They just sat there. It was such tremendous help and I can't explain it. It just was accountability. I knew people that knew I was trying to be sober and work, sat there. And I was like, 'Wow, this is really powerful.' "
Send Me a Friend pairs volunteers with musicians trying to stay sober on the road. A network of people who have more than a year of continuous sobriety is available — to come to a performance and act as a buffer, for instance, when fans want to buy you a drink. Osborne says Send Me A Friend is different from Alcoholics Anonymous or other recovery programs. "It's all about going back to work. It's not about getting anybody sober. That's not my job," he says. "It's just, if you have chosen to not drink or [do] drug[s] anymore but you want to stay in the music industry — you want to go back to work. Well, we're going to provide one small little service, which is, we're going to send somebody out to sit there with you." Musicians who want a friend submit an email with their tour dates, and Send a Friend tries to connect them with someone on every stop. "It's pretty awesome," says a Boston singer who has used the program. "You just send in your dates and they send you friends." NPR has agreed not to use the singer's name because the program guarantees anonymity. She says she hasn't relapsed once when a "friend" was backstage at her concerts. She says the key is knowing that you're not alone when you're in the thick of it. "You're right next to a big bar of alcohol. And you're in the music scene where drugs are just flowing like a waterfall," she says. "So having somebody right there with you who knows the temptation, it's an unbelievable gift." She says her contact with Send Me a Friend came at a time when she was afraid she was going to have to stop performing. "And I don't know what's worse, to be honest with you. You know, having my life spiral out of control but being able to play music — or being steady and stable and not getting to play music," she says. "I know that sounds extreme but that's what music is to me." Osborne says the program is not just for the rock star who hits rock bottom, but for anyone who's there for the gig — dancers, sound techs and roadies. "You can just be a piano player down on Bourbon Street," he says. "I mean, you have four or five sets. You're playing small breaks. There's no backstage; there's no tour manager that keeps people away. There's just you just sit[ting] there in the bar waiting for the next set and that's — wow. That's difficult." Osborne says Send Me a Friend is about treating the music industry as a legitimate business, instead of as hobby you have to give up just because you're sober.